Chinese characters have evolved since the first royal dynasties. Each character has a poetic meaning connected to its form and etymology. Calligraphy is considered high art in China and is written in many different styles. Qin Shi Huang (259-210 BC), the First Emperor of China, unified the entire country under one language and one supreme royal seal. From his reign onward the Emperor's seal was the national symbol and all civil and military officials maintained a personal seal signifying their status and position. Seal stone tradition continues to this day and modern people writing letters or calligraphy all stamp their correspondences and artwork with their own stylized Chinese signature. Traditionally carved seals utilize countless variations of character style and placement. Well designed seals are sparse, energetic, and powerful. 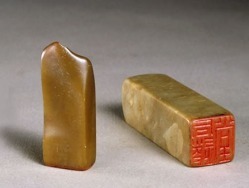 Designing a seal stone for personal use can give your own works of art a touch of ancient China. A seal stone is also the perfect gift to give to friends and loved ones. Your seal may include any Chinese or English characters and/or pictures. Using your chosen images the designer will sketch a sample and after your approval of the sketch the designer will begin manufacturing the seal. All labor will be done by hand by a local seal-carving master and will take approximately one week to complete.